The Tavua Football side will not be an easy team to beat in the 2017 Courts Inter District (IDC) Tournament says president Pranesh Prakash. This is after the gold miners secured a spot in the Premier Division after winning the second leg of the Vodafone Senior League fixture against Seaqaqa last Saturday. The Saroj Kumar coached-side had secured a spot in the top division of football after a 3-1 win over Seaqaqa in the second leg of the 2017 Vodafone Senior League play-off after a 1-1 draw in the first leg. Prakash said he was so proud to take the team back to the premier division. “I am so proud today, we had the support from our vanua and all the people and were confident of making a return this year. This is my third year as president and today I have achieved a dream which I had for a long time and thanks to the players and officials,” Prakash said. “This will be after four years that Tavua will make a return to the top level in football and it is a big achievement for us. Prakash said they would have celebration to honour the players. “We will be having a carnival in Tavua next week and will join in the float procession to mark the victory,” he said. Prakash said they have a motto to only have their own players rather than pouching from other districts. He said he would love to see players who were playing in other districts to make a return. He accepted that they would need some experience players to battle the top guns in the premier division. He said don’t count us out we would put a big challenge in Courts IDC. In the match proper both teams displayed some entertaining football in front of the huge crowd gathered at Subrail Park in Labasa. Seaqaqa scored first through Lekima Rakariva in the 60th minute before Tavua’s substitute striker Atunaisa Livanalagi equalised in the 65th minute. Goal scorer Rakariva was send off after referee Deepak Mudaliar showed the marching orders in the 67’ minute for man handling. Seaqaqa playing with one man down gave the visitors advantage and Livanalagiscored again in the 88th minute to extend Tavua’s lead. Tavua hammered the final nail in the 89th minute through Lekima Rokolio. Kumar said the players had the heart to win an all-important match for the people of Tavua. “We were confident of winning the match and coming into the premier division though we drew 1-all in the first match and then in the second match Seaqaqa took a lead in the second half, the players fought gallantly until the final whistle to take Tavua back to where it belonged,” he said. “The players stuck to the game plan despite Seaqaqa scoring first in the match. Tavua had defeated top teams Suva, Ba, Lautoka, and Nadi in the past. 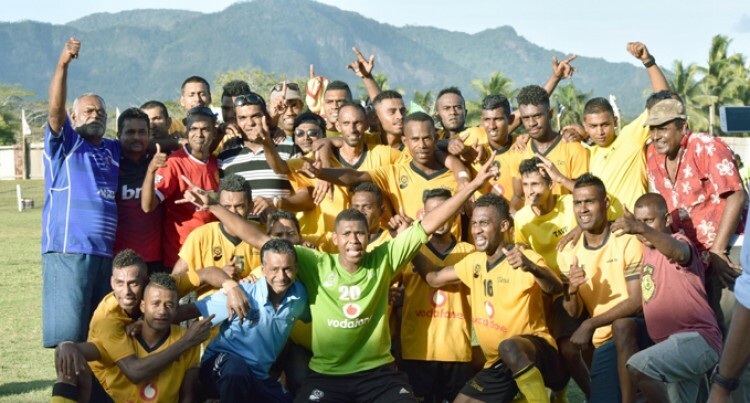 “The players were committed and dedicated towards the team and most of them are born and bred in Tavua and with the same level of commitment and dedication we can tackle big teams again,” a happy Kumar said. He dedicated the win to his team captain Niteshwar Reddy’s nine-day-old baby boy and to the people of Tavua. The Gold miners last won the major tournament in 1994 when they won the Vodafone Fiji FACT and in 1995 they clinched the Courts IDC trophy. Tavua received the prizemoney of $6000 while Seaqaqa walked away with $2000.